This one's for those of you in the suburbs. The Halfway Café is celebrating the anniversary by offering a special roll back menu with pricing reflecting the 1990’s menu at all Halfway Café locations. This is a way of thanking loyal customers and providing an unbeatable deal for those unfamiliar with Halfway Café’s award winning menu. The Halfway Cafe was founded in Dedham, MA in 1964 and was purchased by the current owner, John Grasso, in 1990. The Halfway Cafe has grown to six locations in Canton, Watertown, Dedham, Holbrook, Marlborough, and Maynard. Click (here) for the Halfway Cafe website. 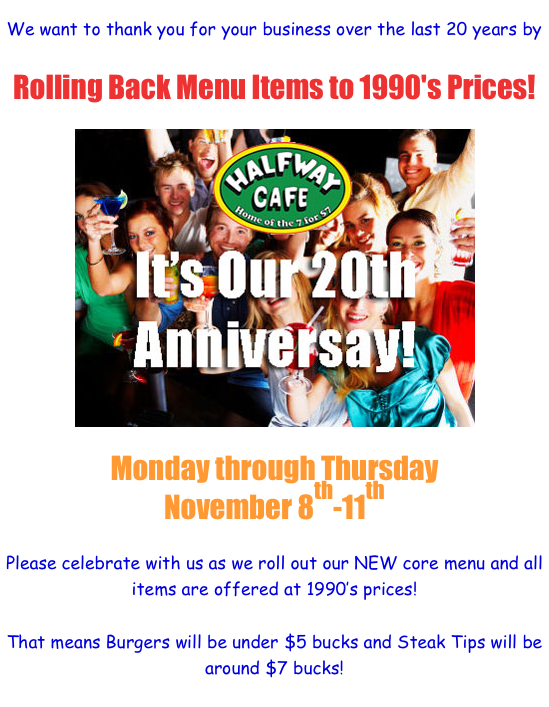 0 Response to "Halfway Cafe Celebrates 20th Anniversary"